Last week, Qantas shocked the industry (and passengers) by grounding its fleet and locking out its employees. Now Qantas is flying again — but it’s flying into more crowded skies. In the past three days, two of Qantas’s competitors have launched new low-cost brands. On Tuesday, Singapore Airlines introduced Scoot. 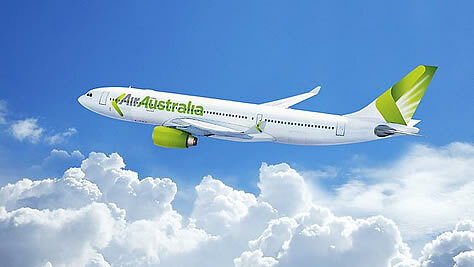 Then, on Thursday, Australia’s Strategic Airlines unveiled its new name, Air Australia, and a new, low-cost focus. Air Australia’s new livery is pictured above. As an act of mercy, I am saving Scoot’s for after the jump. There it is. Sorry you had to see it here. Both new brands are part of a breed of carriers unheard of in North America or Europe: the long-haul budget carrier. Scoot — based in Singapore which, needless to say, has no domestic air travel market — will fly not low-cost favourites like 737s or A320s but twin-aisle 777s. Air Australia will fly A320s domestically but it will also fly A330s as far as Bali, Phuket, and Hawaii. The carriers will compete with Qantas. They will compete with Qantas’s low-cost carrier, Jetstar. They will compete with Virgin Australia. And to some extent they will even compete with each other. It does stand out in a way. But “Scoot” is also the latest in a long line of irritatingly cutesy names for low-cost carriers. “Song.” “Ted.” “Tango.” It’s hard to hear names like this without rolling your eyes, and once your consumer’s eyes are rolling it’s awfully hard to get them to stop. What really kicks Scoot past irritating to insufferable is its promise to travellers of — are you sitting down? — a whole new Scootitude™. Between the name, the MS Paint livery, and the dreadful “Scootitude” advertising that is sure to come, Singaporeans seem to be treating the new carrier with scepticism. By contrast, Air Australia’s name is conservative. It is, in fact, only slightly less conservative than the carrier’s existing name, “Strategic Airlines,” although unquestionably it is a step up. The new livery, designed by CumminsRoss, looks very smart. It looks even better on a real airplane than it does in the rendering. Just about everything about the brand seems much more thoughtfully developed. The boomerang may seem an obvious choice, the selection of lime green a less obvious one. But green and gold are the colours of the Australian football team. It’s a smart choice that could help position Air Australia as the people’s airline. With the problems that continue to plague Qantas, the timing couldn’t be better. Still, as I’ve written before, airlines are never saved by their brands. Air Australia may be better branded, but it is still a very small airline taking on a very crowded market with some very large, established players. With backing from Singapore Airlines, Scoot is much better-capitalized and may find it easier to stick it out. well done , great out look , now that air australia have gone arse up. maybe they should have had a name like “stranded air ” a name is a name you are not going to dodge an airline company due to name .